Apart from the MD of PwC Malaysia, Mr Chin Kwai Fatt, the man who is the real power there, and Dato' Johan Raslan, the Executive Chairman of PwC Malaysia, who follows what Mr Chin says, there are two more senior partners, Mr Lee Tuck Heng and Mr Khoo Chuan Keat, who are parties to the ongoing fraud perpetrated by PwC in Malaysia with regards to the non disposal of PricewaterhouseCoopers Consulting Sdn Bhd (464379-U) to IBM Corp, when PricewaterhouseCoopers LLP sold its global management consulting and technology services business to IBM Corp back in 2002. Mr Khoo Chuan Keat, as the Tax Leader and Senior Executive Director in PricewaterhouseCoopers Malaysia, leads a team of 30 tax partners and 280 other fee earners. In fact PricewaterhouseCoopers won the Tax Firm of the Year Award for Malaysia, awarded by the International Tax Review recently. 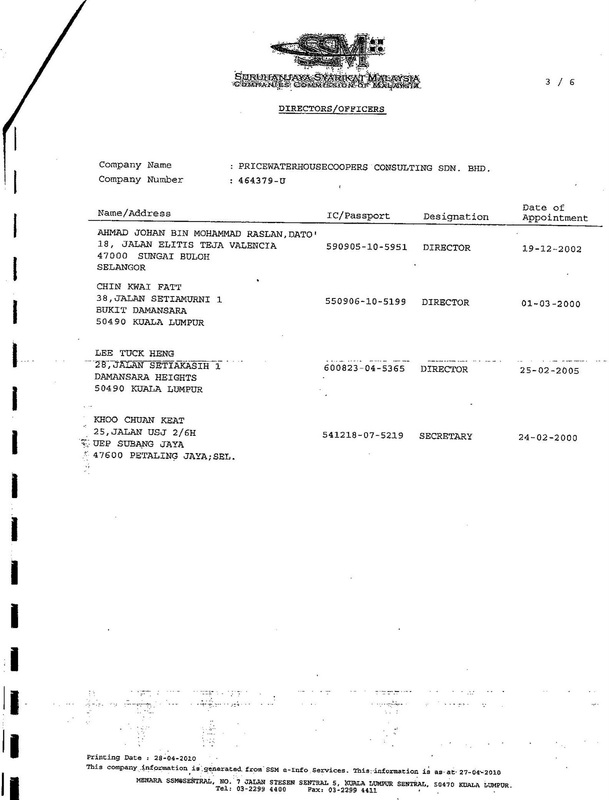 So what is Mr Khoo Chuan Keat's role in the ongoing PwC fraud? 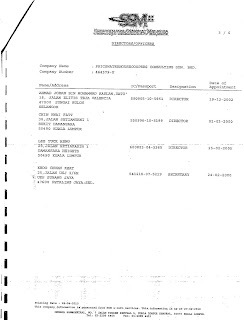 He is the Company Secretary for PricewaterhouseCoopers Consulting Sdn Bhd (464379-U), the company which remains in existence and hides several hundred millions of Ringgit of contingent liabilities from the sale of PwC's consulting services to IBM Corp back in 2002, while defrauding creditors, as how can a dormant company meet its contingent liabilities when it no longer generates revenues? PricewaterhouseCoopers Consulting Sdn Bhd (464379-U): Dormant, generates no revenues, but has several hundred million Ringgit in contingent liabilities. Mr Lee Tuck Heng, seated third from left, talking to Mr Goh Ching Yin, who sits in the Audit Oversight Board and is an Executive Director in the Securities Commission, and another Director from PwC Malaysia. 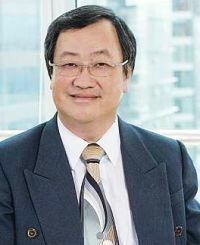 The other 'rogue' Senior Partner in PwC Malaysia is Mr Lee Tuck Heng, who is not only a Director in PricewaterhouseCoopers Consulting Sdn Bhd (464379-U), but also one of its two shareholders together with Dato' Johan Raslan. In the picture above, Mr Lee Tuck Heng is seen in conversation with a member of the Audit Oversight Board, and Execurive Director in the Securities Commission, Mr Goh Ching Yin. The facts in the questionable registration of PwC Malaysia, a registration that is both a legal and a physical impossibility, by the Audit Oversight Board, which is run by one of PwC Malaysia's former Directors, Mr Manohar Benjamin Johnson, can be read here.